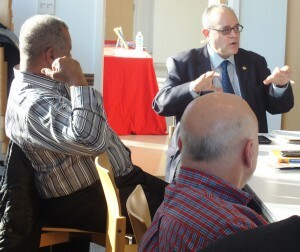 Chicago, IL, December 23 – On Dec. 19, the Illinois Council on Responsible Fatherhood held its free annual fatherhood symposium at the Oak Park Library in Oak Park, IL, moderated by ICRF Chairman and Attorney Jeffery M. Leving. The symposium empowered single fathers and provided community leaders and ministers survival strategies to take home. Positive paternal involvement has been shown to improve academic test scores, reduce teenage pregnancy, and encourage confidence in children. The symposium presented professionals who spoke on a wide range of critical fatherhood-related topics focused on keeping children safe. Attorney Leving and ICRF council members want to ensure that fathers are provided the essential support and parenting tools to assume the important role they play in their children’s lives. Chicago Matrimonial Attorney Maureen A. Gorman lectured on successfully appealing DCFS findings against dads falsely accused of abuse. Maureen has a highly successful track record and won four of these complex and difficult appeals in a row. Illinois Detective Wayne Halick discussed how to keep children safe from harm in the Internet age. Wayne has saved children from harm, abuse, and human trafficking. Detective Halick is a board member of the Fatherhood Educational Institute, a not-for-profit organization that promotes a positive fatherhood environment across all communities. Lois Rakov, an ICRF council member, presented a topic entitled “Outreach for Fatherhood Involvement” that provided helpful tips on promoting responsible fatherhood. Intellectual property attorney Mark Petrolis encouraged the fathers at the symposium not to give up hope and to fight for their rights as parents despite the injustices of the legal system. Attorney Leving is a leader in the fathers’ rights movement, attorney and author of the book How to Be a Good Divorced Dad, which has received praise from President Barack Obama, and was endorsed by Cardinal Francis George of the Archdiocese of Chicago. He has spent his life making significant strides supporting paternal involvement. The Illinois Council on Responsible Fatherhood is made up of experts from various facets of the professional world, each immensely dedicated to supporting single and divorced dads in Illinois. For more information, visit responsiblefatherhood.com.